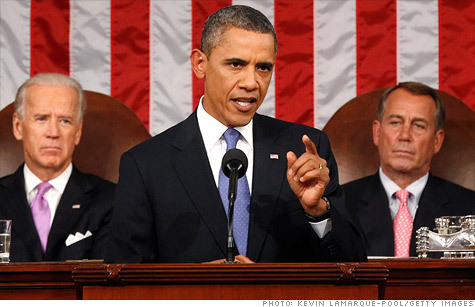 President Obama called for Congress to again extend help for the jobless. "At this time of prolonged hardship, you should pass it again -- right away." NEW YORK (CNNMoney) -- President Obama unveiled a stimulus plan Thursday night that he says will boost hiring and provide a jolt to the stalled economy if it becomes law. A mix of $253 billion in tax cuts and $194 billion in new spending, the total bill for the plan is $447 billion. Given staunch Republican opposition to most new spending, the measure has almost no chance of passing the House in its current form. But select parts of the bill could become law, and provide a measure of support for an economy at risk of falling into another recession. "There is no problem that is more urgent," said Pamela Loprest, director of the Income and Benefits Policy Center at the Urban Institute. "Economically, the plan hits different places. There are different parts of the economy Obama is trying to jolt." So what exactly does the president want Congress to do? Payroll tax cuts: Employees normally pay 6.2% on their first $106,800 of wages into Social Security, but they are now paying only 4.2%. That tax break is set to expire at the end of the year, and Obama would like to expand and extend it. He would cut it in half to 3.1%. Obama also wants to cut the payroll tax businesses pay in half -- to 3.1% -- on the first $5 million in wages. And if a business hires a new worker or gives an existing worker a raise, all payroll taxes will be waived. Total cost: $240 billion, or more than half the total package. Other tax measures: Obama would offer $8 billion in tax credits for companies that hire workers who have been unemployed for six months or more and $5 billion in tax incentives for companies to invest in equipment and plants. Infrastructure bank: Democrats, and Obama in particular, love talking about investments in infrastructure. One top priority: a national "infrastructure bank." Here's how it would work: After an initial round of funding -- Obama called for $10 billion -- the bank would offer loans to give private-sector projects a jolt of money. Eventually, interest paid on the loans would make the bank self sufficient. On Thursday, Obama said funds would be distributed based on "how badly a construction project is needed and how much good it would do for the economy." Immediate surface transportation: Nodding to an idea supported by both the AFL-CIO and the U.S. Chamber of Commerce, Obama proposed $50 billion in immediate funding for highways, transit, rail and aviation. Modernizing schools/vacant property: The president wants to spend $25 billion to modernize at least 35,000 public schools. In addition, $5 billion would go to improving community colleges. A separate measure -- dubbed "Project Rebuild" -- would put $15 billion toward fixing up vacant and foreclosed homes and businesses. Extend unemployment benefits: Nearly 43% of the unemployed have been so for more than six months -- a drag on the economy that Obama wants to soften by extending unemployment benefits once again. Lawmakers first lengthened unemployment benefits to the current 99 weeks in 2009, and then reauthorized the measure five times since. The White House estimates another extension would cost $49 billion. "Democrats and Republicans in this chamber have supported unemployment insurance plenty of times in the past. At this time of prolonged hardship, you should pass it again -- right away," Obama said. Help for long-term unemployed: The president wants a new tax credit of up to $4,000 for businesses that hire workers who have been out of a job for over six months. Subsidized jobs training: Following the lead of a job training program in Georgia, Obama wants to offer the unemployed a chance to work temporarily as a way to build their skills while they search for a permanent job. In the existing Georgia Works program, participants don't get paid, but they do get to keep their jobless benefits and receive a stipend of up to $240 for transportation and other expenses. Teaching and first responder jobs: Obama is asking for $35 billion to be pumped into local communities to keep teachers and first responders on the job, while also allowing for some new hiring. Of that, $30 billion would go to educators, and the rest to first responders. Summer jobs: Obama wants to give hundreds of thousands of youth "the hope and dignity of a summer job next year." The unemployment rate for youth ages 16 to 24 rose to a record high this summer. Housing help: He also vowed to work with Fannie Mae and Freddie Mac to help homeowners refinance their mortgages at historically low interest rates around 4%. (Check Obama's housing scorecard). How he'd pay for his plan: Obama vowed his plan would be fully paid for and asked the new debt super committee, already charged with proposing between $1.2 trillion and $1.5 trillion in debt reduction over a decade, to add the cost of American Jobs Act to its goal. So presumably if the panel did that, its new target would move closer to $2 trillion. The president said he would submit his debt-cutting plan to the super committee on Sept. 19. He characterized it as "ambitious - a plan that will not only cover the cost of this jobs bill, but stabilize our debt in the long run." His recommendations will include additional spending cuts that would phase in gradually, "modest adjustments" to Medicare and Medicaid, and a tax reform plan 'that asks the wealthiest Americans and biggest corporations to pay their fair share." --CNNMoney senior writer Jeanne Sahadi contributed to this report. Obama's 17 tax breaks for small business: Big whoop!